Geologists have long wanted to peer inside a volcano. Although we have good evidence from extinct and eroded volcanoes of their inner structure, we know little about the conditions in and near active volcanic conduits. Indeed, few features important to the study of geologic hazards have so much speculation but so little direct information available as the conduit of an active volcano. Geologists have been drilling the Unzen Volcano in Japan, shown here from northeast, to learn more about the processes that lead to an eruption. A new dome from a 1991-1995 eruption event forms the summit and left skyline. A white circle marks the drill rig. Courtesy of the Unzen Scientific Drilling Project. Direct observation of such a dynamic subsurface system requires drilling. The obstacle in the case of volcanoes is not depth: The important processes that control eruption dynamics appear to operate in the uppermost few kilometers of magma ascension to the surface. The challenge is not temperature or toxic and corrosive fluids: Drilling in geothermal systems has successfully dealt with conditions nearly as severe as what may prevail in volcanic conduits. Nor is it the fear of triggering an eruption: Only the most fluid basaltic magmas could flow through a small-diameter borehole, and drilling can only be a tiny pinprick of a perturbation to such a huge system. The true obstacle has been to assemble the necessary resources, talent and, most of all, the will to take the audacious step beyond the ordinary and drill into the unknown. We are now surmounting that obstacle with the Unzen Scientific Drilling Project, a joint undertaking of the Japan Ministry of Education, Culture, Science, Sports and Technology and the International Continental Scientific Drilling Program. 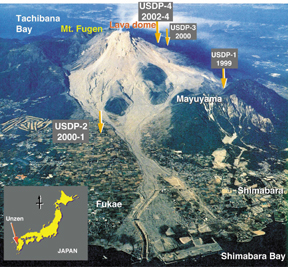 During this year, the project should reach and sample the conduit of Unzen Volcano in Nagasaki Prefecture, Japan. Because modern eruption forecasts rely on interpretation of geophysical signals emanating from volcanic conduits  in particular, microseismicity, surface deformation, and gas and thermal emissions  understanding conduits will inevitably lead to improved interpretation of premonitory signals and hence to reduction in losses of life and property during volcanic crises. Textbooks almost uniformly confront us with the view of a volcano as a cone with a central pipe. Anyone who has thought about this will realize that the central pipe cannot be open during repose; rather, it will be filled with magma crystallized at the end of the last eruption. As such, it may not represent the weakest path for new magma to the surface, but the strongest. So why does magma repeatedly follow the same path? Indeed, why does magma erupt at the summit at all? Upward flow cannot start as pipe flow but must start as a fluid-filled crack or dike, and the rising magma cannot be too dense or it could never reach the top of the volcano. For magma to emerge as lava instead of exploding into ash, it must lose an immense amount of gas, mostly steam, during its journey up the conduit. This is the central question of our drilling project and perhaps the most important problem from the standpoint of understanding eruptive behavior: Can we, by examining the structure, permeability, gas pathways and conditions of a conduit, understand why some volcanoes explode while others ooze? Unzen looms with a frightening steepness above the small coastal city of Shimabara in Nagasaki Prefecture. A lava eruption at its summit in 1792 was followed by catastrophic collapse into the sea of Mayuyama, a subsidiary dome, which took part of the town with it and caused a tsunami that killed some 15,000 people. This was Japans largest volcanic catastrophe. The town of Shimabara sprawls at the foot of Unzen Volcano. Light areas are those devastated by the 1991-1995 eruption. The partially vegetated face of Mayuyama is the landslide scar from collapse into Shimabara Bay just after the 1792 eruption. Flank holes USDP-1 and USDP-2 explored growth of the Unzen edifice. USDP-3 was a pilot hole to test drilling conditions high on the northern slope. 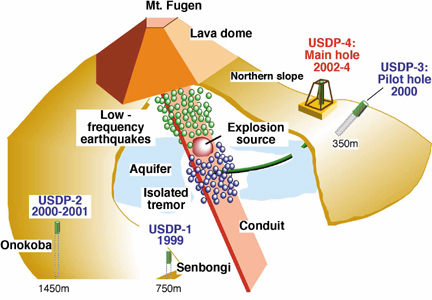 USDP-4 is targeted to reach the conduit for the 1991-1995 eruption. In the background is Tachibana Bay, where the first seismicity associated with rise of Unzen magma occurred in 1989. Courtesy of the Unzen Scientific Drilling Project. More recently, in 1990, the volcano became restless. Earthquakes deep beneath Tachibana Bay to the west were the first sign of new trouble. These migrated upward and eastward to beneath Unzens summit, and inflation of the edifice began. Within a year, steam explosions commenced from a number of vents at the summit. Finally in 1991, about 18 months after the first earthquakes, lava emerged. Spilling off the summit upland, the growing dome failed and avalanched, generating powerful block-and-ash pyroclastic flows that accounted for much of the ensuing destruction. Forty-four people were killed (all within previously evacuated areas), 15,000 people were subject to lengthy evacuations, and $2 billion worth of property was lost in four years of intermittent volcanic violence that ended in 1995. This event is arguably the first eruption fully monitored in a modern fashion with abundant seismic, surface deformation, gas, geochemical and petrological data collected from its earliest inception to finish. It was also an early success in accurately forecasting the time and point of first emergence of lava at the surface. Most important to volcanology, it is a clear end-member case of eruptive behavior in which a water-rich silicic magma erupted in an almost purely effusive manner. Thus, because of its comprehensive eruption record, societal impact, and scientific importance, Unzen Volcano became the first target of conduit drilling. Discussion of drilling Unzen began almost as soon as the eruption ceased. An international conference in Shimabara in May 1997 started the process of shaping the research. A special issue of the Journal of Volcanology and Geothermal Research, published in 1999, brought together much of what was then known about the volcano and the recent eruption. Next began a program of flank drilling and associated geophysical surveys to understand the growth history of the volcano and provide a view of drilling conditions that would be encountered in the drive to the conduit. Flank drilling produced important scientific results in its own right, showing that the volcano is about 500,000 years old and grew synchronously with subsidence of the graben in which it lies. Unzens earliest history was explosive, but, for much of its life, its petrology and behavior have been similar to that of the modern Unzen. In parallel with these preliminary scientific investigations, we had to resolve difficult issues concerning drilling engineering, logistics and permitting. Foremost among the concerns were that drilling might deplete scarce water resources high on the mountain, destroy important natural habitats of the national park that protects its beautiful summit upland, or interfere with sightseeing and enjoyment by the many tourists who travel to the region. At the same time, the selected drill site needed to maximize the chance of success at minimum cost. Some of these criteria seemed mutually exclusive. We also had to face the question of whether to drill the hole at a slant from the start (necessitating a tilted rig), or to begin it more conventionally as a vertical borehole and then conduct the challenging operation of drilling a turn toward the target with a downhole motor. To maximize chances of hitting the target, believed to be elongate in the east-west direction, an approach from the north or south was deemed desirable. In addition to the turn at depth, the most technically challenging aspect of the operation has been the expected high temperature at depth. Using estimated conduit size, geochemically determined emplacement temperature, four-year duration of magmatic flow, and the nine years since cessation of flow, a conduction model suggested the conduit core could be as hot at 600 degrees Celsius. This is hotter than the record 500 degrees Celsius reached in geo-thermal drilling at Kakkonda in Iwate Prefecture. We expect, however, that most of the edifice is cold, having been devoid of flowing magma since 1792; therefore, the hot interval of the hole will be short. The amount of heat that must be removed to cool the hole during drilling should be within the capabilities of the geothermal drilling industry. We solved some of the drilling issues by beginning the borehole high on the undeveloped north flank of the volcano. The location is geometrically advantageous for hitting the target and is outside the most sensitive national park zone and opposite the side of the volcano accessed by tourists. Visitors can, however, appreciate the excitement of this scientific adventure through exhibits at the new Unzen Volcano Museum in Shimabara. A water well was drilled on the lower flank, and a 4-kilometer pipeline was constructed to supply the drilling operation. The drawback of choosing a relatively remote site was distance from the road system. A forest road had to be improved and extended, at great cost. Drilling of the conduit hole began in February 2003 with a traditional Shinto ceremony that affirmed the teamwork of specialists and laborers who brought the project to fruition and would carry it forward. Soon, however, the drilling began to follow a worst-case scenario. Problems arose from the presence of open fractures and a deep water table in the flank of the edifice. Although this lost-circulation had been anticipated through experience with a pilot hole, the larger diameter of the conduit hole made this problem more severe, interfering with the effort to turn the hole toward the conduit on the proper trajectory. Last April, the operation was halted to allow time to develop a new plan. Drilling resumed in September with more water and a different mud strategy. The turn toward the conduit, begun at a depth of 80 meters, built slowly to 18 degrees at 321 meters deep, 33 degrees at 414 meters, 52 degrees at 620 meters, and the desired final deviation of 75 degrees at 764 meters depth. With this challenge overcome, drilling was stopped at 824 meters depth, awaiting Japans new fiscal year for the final drive to the conduit. As expected, the well at this depth is still cool. From here, the planned trajectory is a straight shot for the conduit 1,000 meters away. As we approach it, we should begin to see a rapid rise in temperature. Perhaps there will be a rise in the degree of hydrothermal alteration of cuttings as well. Intrusive units may become more frequent  in fact, this poses a problem because with a 500,000-year history of small to moderate-sized eruptions, there must be many lithologically similar intrusions at depth. The intrusion of interest to us, however, will be the one that coincides with the temperature maximum. Thus, we may not know for certain of our success in hitting the target until we have passed through it. Penetration of the conduit will yield exciting information as to its width, structure, temperature and the permeability of the environment. For petrologists on the team, developing a complete picture of the system must await a second pass through the conduit. Once the precise interval of the conduit in the borehole is known, the plan is to kick off from the borehole above the conduit and drill through it once again, this time coring continuously. We should then have an uninterrupted wall-to-wall view of the intrusion, which, as magma, fed the 1991-1995 eruption. It would be foolish now and perhaps embarrassing later to speculate extensively on what we will find. We may not find all the answers we seek but instead be able to ask new, more informed questions that take us beyond well-worn intellectual ruts and cartoonistic views. This really is an exploration of the unknown. There still is a new frontier in volcanology: It lies just below the surface. 1. Physical parameters of a conduit for which the eruptive record is well known. 2. Conduit structure, conduit and wallrock permeability, and evidence of gas pathways. 3. Temperature, pressure and fluid conditions in and around the conduit, in order to understand how the magma column interacts with the volcanos resident hydrologic system. 4. A proximal, low-noise observation post, from which to observe the rise of the next pulse of new magma. Image courtesy of the Unzen Scientific Drilling Project. Nakada is professor at the Volcano Research Center, Earthquake Research Institute, University of Tokyo, and group leader of the national geological team studying geology of volcanic eruptions in Japan. He is lead principal investigator and chief scientist on this project. Eichelberger is professor and chair in the department of geology and geophysics at the College of Science, Engineering and Mathematics, and coordinating scientist of the Alaska Volcano Observatory, Geophysical Institute, University of Alaska, Fairbanks. He is also a principal investigator on this project, supported by NSF Grant EAR0310406. Other principal investigators are K. Uto (project manager), H. Shimizu and S. Sakuma. Eichelberger, J.C., C.R. Carrigan, H.R. Westrich, and R.H. Price, "Nonexplosive silicic volcanism," Nature, 323, 598-602, 1986. Schmincke, Hans-Ulrich, Volcanism, Springer, 324 pp., 2004. Nakada, S., J.C. Eichelberger, and H. Shimizu, Editors, "Unzen Eruption: Magma Ascent and Dome Growth," J. Volcanol. Geotherm. Res., 89, special issue, 1999. Yanagi, T., H. Okada, K. Ohta, Editors, Unzen Volcano, 1990-1992 Eruption, Nishinippon and Kyushu University Press, Kyushu, Japan, 1992.